BBC News - Does winning the lottery make you happy? The case of the couple who won £56m on the EuroMillions raises a perennial question. Does winning a huge amount of money make you happy? Call it envy, jealousy or moral disdain, but there's no doubt that many of us have a problem with what we deem to be unearned wealth. Go back in history and you'll see sticky ends attributed to the fabulously wealthy. 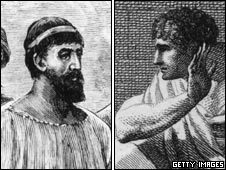 King Croesus was supposedly burned alive on a pyre, while Crassus was made to drink molten gold, but both these grisly fates may simply have been wishful thinking on the part of the envious. More recently, lottery wins seem to provoke heated discussion at the watercooler and in the back of taxis. Do they enjoy their windfalls? Or does their good fortune have the capacity to make them miserable, leaving them rudderless in a morass of luxury? There have certainly been many winners who had their lives turned upside down by a big win. Relationships can break down under the strain, friendships can come under pressure. And the tabloids love nothing more than a winner who has frittered away all their money. From a mental wellbeing point of view there are clearly dangers. Psychologist Caroline Schuster-Cotterell says a big win can leave people reeling in much the same way as any other major, life-changing event. "It really can be disruptive. The first thing is the shock, not expecting it and suddenly winning. It is the speed and rate of change that tend to cause people trouble." And the whirlwind of change helps to explain those newspaper stories about relationships foundering. "The further aspect is changes in relationships with close friends and family. Attitudes can change," says Dr Schuster-Cotterell. "When one has a large win one is temporarily stunned and one doesn't have such clear judgement as one normally would, making unwise decisions on several aspects of life." But for those who like to engage in Schadenfreude there is disappointing news from the studies that have been done on lottery winners, says Prof Andrew Oswald, of Warwick University. "Although many people don't want to hear the evidence, it is overwhelmingly that winning the lottery makes you happier and improves your mental health. People find it easier to engage in Schadenfreude." Prof Oswald's tactic has not been to study only lottery winners. Instead he has taken a massive sample, of 50,000 people, and studied them over time in the hope that lottery winners would crop up. "Fortunately for a scientist, a large proportion of people play the lottery. In our latest work the largest winner gets a million euros." And the results, which Prof Oswald says have been replicated elsewhere, are clear. "There is no doubt there is a very strong [initial] euphoria, then the evidence suggests people don't enjoy the money for the first year or two." It's not clear why there is this gap before lottery winners start to really enjoy themselves. "We have postulated after the euphoria wears off, in their subconscious they realise they don't deserve the money and it takes a while for this non-deservedness to wear off," says Prof Oswald. But there are some bad effects of a win, notably in someone's health. "They start to smoke more and drink more," he says. "We think that may be bad for their health and hold down their happiness for a while." This type of research is important in the field of behavioural economics as it offers evidence for one of the great political and social questions. "All politicians speak as though if they could make their citizens richer it would make their citizens happier. This is the closest we have to randomly assigned forms of money." But of course, while the odd millionaire can crop up in a long-term study, it's not going to be possible to study the psychological effects on the mega winners. "There is no quality research on what happens to people with absolutely enormous wins - £50m is so extreme it is hard to know how to fit it in." And the newspapers have often relished the travails of the big winners. 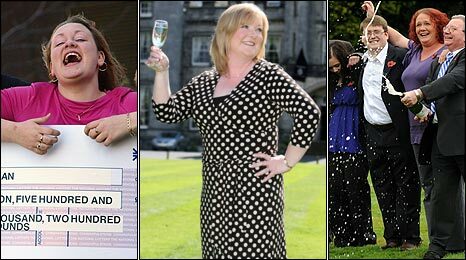 In 2007, one tabloid noted that a multimillion pound winner had put on a stone, split up with her boyfriend and become reclusive. Interviews with those who have frittered away the money or been through a personal ordeal make more impact than those who have lived quietly and happily. But the latter appear to be plentiful. Grimsby-born Roy Gibney won £7.5m in 1998 and says life is "absolutely marvellous". He lives in a villa in Cyprus with his wife and child much of the year, spending some time in Nairn and some in Grimsby. That is not to say that he is never unhappy. "If you take a normal life everyone has ups and downs but multiply it by an awful lot. The happiness it can bring is multiplied by a thousand times but it can bring heartache as well as people trying to rip you off. "Obviously, I've had my downs - family falling out with you because they want more money." But the key thing is retaining a "sensible head", he says. His grown-up daughters had houses bought for them, but they still have to work. "I won when I was 44 - it was the right age to win it." But ultimately he views his life as full of opportunities he would not otherwise have had. "Me, my wife and son flew to New York a couple of days before Christmas. We couldn't have done that normally." 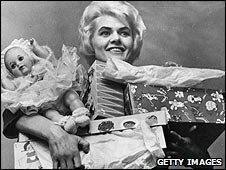 Many journalists have been to speak to Viv Nicholson, the woman who famously vowed to "spend, spend, spend" when she scooped £152,000 on the football pools in 1961. People expect that having spent all the money and endured a number of personal tragedies they will hear a story of regret and the corrosive power of sudden wealth. But they are disappointed. "My experience was fantastic," says Mrs Nicholson. "I just had everything, did everything I wanted, things that I would never have had. I don't regret a thing. I did it my way. I live my life the way I wanted to." She is dismissive towards those who emphasise the value of saving over spending in the pursuit of happiness. "Life is boring and there is too much nonsense." The big winners now have a support structure provided by Camelot's winners' advisers. It is in the firm's interest that winners appear happy. Dot Renshaw, former head of player services and now a consultant for Camelot, advises winners to take a holiday somewhere new in the immediate aftermath of a jackpot. "Try and get a holiday away from everything so you can try and come to terms with what's happened," she says. "Friends and family will have their own ideas of what you should be doing. Don't rush into anything." Subsequently they line up a meeting with financial advisers and lawyers on how the money can be put to use, tax issues, and the making of a will. But there is also help with the psychological side, both from former winners who are still in touch with Camelot and the advisers. "We are not qualified counsellors, but we have over 40 years experience [between us] of dealing with jackpot winners." And for many people happiness is about enjoying their windfall while retaining their old friends and relationships. "Their true friends are there for them," says Ms Renshaw. I won over £250,000 on the lottery when I was 22. I'm now 34 and when I look back I do wonder if I'd do things differently if I won it again now. That being said, I live in my own house without a mortgage and I'm as happy as I think possible. The happiness isn't down to the money though, as it can't buy you health. There are lessons you learn in life and as you get older you realise true happiness isn't down to money. It does however give you security, peace of mind and new opportunities. It's easy to get carried away with a win of that size, but my only advice to people would be to keep sight of what is important, don't lose your family or friends. There are of course people who will try to take advantage - ditch those asap. Money does not make you happy in itself. Money gives you choices. The choice to buy a dream home, the choice to not work, the choice to give to charity. The core to being happy is making the choices that are right for you. I think many make the mistake of assuming materialistic gain is everything and quickly realise it can be hollow because because they make stereotypical choices and not their own. In itself, money cannot make you happy but it can remove many stresses and pressures that get in the way of happiness. 3. Pay off mortgages for the family. 6. Invest the rest and continue working. For me, happiness is having goals to accomplish, if one of the goals is to be rich and that suddenly gets scrubbed off the list, there had better be something new to replace it or you would be feeling worthless pretty fast. Although I must add, goals of riches alone never make anyone happy. Humans need to feel like they have a purpose. So as you can tell - I'm quite prepared. Send on the jackpot! I never enter any kind of lottery, precisely because I don't want to win a large amount of unearned money. I don't have a lot, but I'm happy with a comfortable life, good health and the ability to take pleasure in the small things in life. Of course winning a lottery would make me and my wife very happy. But if we ever did, we have made up our minds as to what to do with the money - 90% of it would go to charities and helping those who really need help, people who are having their homes repossessed by banks, people who lose everything in a natural disaster, etc. How much money do we need to carry on with our lives? A million in our account would do us and the children for always. I basically think these rollovers become obscene. Why not split the jackpot further down and give more people a chance of also winning lottery money? One person gets a vulgar amount while another picks up £5. I remember when I was young all I wanted for Christmas was a remote controlled car, I told myself then I would be happy, I got it, I was happy. By early January the happiness had worn off, I now found myself saying the thing that would make me happy would be a remote controlled hovercraft. That is a mini picture of our lives, so many things promise us happiness, but they only satisfy us for a finite amount of time then we are looking for the next big thing. To quote CS Lewis, it is as if "something has evaded us". If you are looking for volunteers to test this - I am available. But seriously, enough to clear debts and pay the mortgage off would be enough for me to live happily on my salary. I'm not sure I could cope with having millions of pounds - I would probably get bored if not working too. Wealth without work was number on his list, and he achieved a lot. I remember a story of a working class east London couple who won the pools very many years ago. They moved out to the stockbroker belt and bought a huge house there with a swimming pool. They invited their friends to come down, have a swim, drink lots of booze. Their friends came a couple of times, but then stopped coming. So the wife tried to make friends with the neighbours, but they didn't want to know. In the end they were so lonely that they sold up and moved back to East London. Friends make you happy, not money. Of course a lottery win makes you happy. Unless of course you are already so rich that some more millions won't make any difference, but let's be honest, who wouldn't want to win the lottery to get out of financial troubles or just to treat yourself and your loved ones to something special or to secure the future of your kids or again, loved ones? There is so much good you can do with a lot of money and that alone should make you happy. I would like to win enough so we could afford private health care for our daughter and she could have the insulin pump that would make her life easier. That would make me happy and give me peace of mind, knowing that I've provided for her when I am gone. It's all about how your life was before you win the money. If you've lived a somewhat poor and penniless existence, this sudden income can been a welcome chance to free yourself from the endless grind of routine work patterns and endless pressure to sustain yourself and your family. Whereas if you've lived a comfortable life and with opportunity to get away from life's stresses quite easily, the increase in money give you opportunity to over-indulge, where you can easily forget the plight of friends and family and soon you're unable to relate to them. Ultimately, given the way culture and morals have changed over the years, whether you deserve the money is more significant than what you do with it. A work friend of mine got very anger over the fact that the EuroMillions winner had already won £55 on the Wednesday draw, crying "He shouldn't have been allowed to enter again." The value of a pound means different things to different people, and if you've reached the point in your life where you don't think £10 to £20 is a lot anymore, you shouldn't be allowed to enter competitions like this. Or if you already have a "comfortable" income, then some of your winnings should be donated to charity or spread among other ticket holders. Why shouldnt the chap be allowed to play the lottery again after winning £55?? What a load of nonsense. This world is full of jealousy and envy. I for one am pleased for the lucky pair. People spend too much time moaning that some shouldn't have this, and others shouldn't have that. Stop worrying about what everyone else has and concentrate on what you have. I hope this couple have a fantastic life. I hope they will enjoy every single minute of being so fabulously rich that nothing is out of reach. If they decide to give a bit to charity, then good on them. But if they don't, so what. It isn't anybody else's money to comment on it. Perhaps my day will come soon, but until it does, good luck to anybody who's does. I disagree with Nicola Snow - I think people who have generally struggled financially in some way or other, or have grown up without much money, are more likely to have difficulty accepting/managing their new wealth. Look at Michael Carroll, blew the lot and now skint. If your background has been more secure (I don't mean rich, by any means) then you're possibly not so likely to go over the top with it, forgetting others' situations around you. I certainly wouldn't anyway - friends and family are all that matters, whether you're rich or poor. Nicola, I agree with you. How happy would this couple be knowing that there was a children's cancer ward named after them, or a local hospice, or a district hospital in the new town in Port au Prince. Or all three. That would give them immortality, not just short term pleasure. But good luck to them whatever they do.